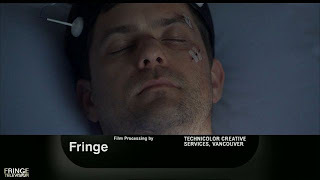 Fringe Discuss: What Will Happen Next To Peter Bishop? It's time for another round of "Fringe Discuss", the weekly post where we give you a question, so you can weigh in on the topic of the week. 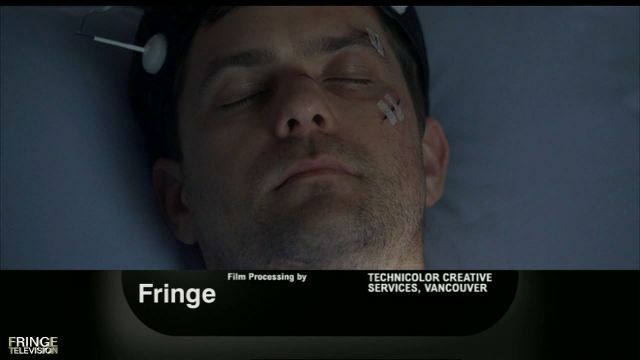 Toward the end of "6:02 AM EST" we saw Peter lying unconscious in a hospital bed after getting rejected by "the device". So this week's question is: Why was Peter rejected by "the device", and what will happen next to Peter Bishop? I would love to hear your comments and theories on this so please post them in the comments below. And remember, please do NOT post any spoilers here. Post your spoiler comments in the "Spoilers" section of this website. Also: I couldn't think of a good poll topic this week, so if you have any ideas, leave a comment, a we may use your idea for a poll. He will probably sit in the sidelines as usual. He was rejected because the alternate device is reconizing that Peter is already running it. To the device on this side Peter can't run it because he's being reconized as the peter from the red universe who is already running the machine. Peter has to cross universes in order to stop the device. He will have the red Fringe team along to help out. He and Olivia will change the game. "Toward the end of "6:02 AM EST" we saw Peter lying unconscious in a hospital bed "
really ? which scene ? I think Peter will wake up affected by the device , that knock he had is hardly safe, definitely there is something beyond that, like reciprocity, the doctor said he's fine, but he clearly wasn't , he was weaponized ... I'm not expecting health essues as much as "weaponization essues", I think in 6:02 AM we've heard the last words from our Peter, when he wakes up, we'll meet another Peter. He was rejected, because... isn't he always? Heh! What will happen next? He will lie in bed like a good boy and let others save the day, duh! I think he will see the future some how, as a consequence of the massive energy the machine blasted him with. When he awakens, he realizes that what is happening is not even the beginning to what will happen, so, somehow, he'll find a way to destroy the other universe, without any guilt, after becoming truly weaponized, in a sense. Well, i think he couldn't get into the machine because...(dunno how much this is a spoiler)..well beacuse of what we saw in the latest promo. I would have to agree with Sharkman73, even though I don't know if there is an actual device on the other side. But even if not, they are connected and I'm sure it probably doesn't recognize him anymore but peter's son. Someone will definitely have to go to the other side. The possibilities are endless, and endless praise to the writers, who took a silver B+ show and have turned it into Gold over the last year or so. (at least I hope I am). I feel that he was rejected due to the piece that Fauxlivia stole earlier this season. This past episode she stated to Walternate that he needed the piece from Over Here to make the device work. It stands to reason that the corresponding piece from Over There is missing (or stolen by someone that Walternate should not trust...). Therefore if said piece is required for the machine to work in one universe, it'd be required to make it operational in the other one, too. Now if only we could get that missing final piece Over Here. Maybe the person who presumably stole it from Walternate brought it to our side and he'll pop up with it and give it to Olivia. Then Peter can do what he must in order to save the universe. aka Sam Weiss who, in the previews for 321 (haha, 321 go/finale) he seems to have a piece of the machine in a box, maybe he stole the other side's (piece Walternate took from here - which is why he had to take it from here) so they couldn't start it first & that's why he's surprised that their side turned on the device first? To keep the story ball rolling, I am imagining, he might land himself in yet another universe, where he meets yet another version of Olivia and come face to face with himself. He will reunite with his Olivia in season ten. That's just my opinion. Maybe there might not be many trips around the cosmos, but it would spice things up. Has this been done in ff? English is not my mother tongue, but I'll do my best to express my theory. I agree with Anthony and Sharkman73, the device was turned on with peter's son DNA, so it must recognize that Peter is running it. I keep thinking that Sam Weiss has the missing part of the device Over There, because he said that I shouldn't happened like it has. He probbably knows a way to turn the device off but needs our Olivia in order to complete it, that's why he looked for her at the end of the last chapter. I can see Olivia who has special abilities to go between worlds--to get a missing part. But, Peter had some control over the machine here in past eps. Peter was rejected by the device because the other device is on. If we go what Sam says to Olivia in the next episode, that is wasn't supposed to happen this way, and the blueverse device was supposed to be activated first. Now that the other one is activated, the current is travelling *through universes*, therefore Peter cannot touch it, nor can anyone. Peter can turn it on and start the current, which he has done (his chromosomes on the other side) but cannot turn the current off. I predict that the one that can turn the current off is Olivia, which is what they will try to do in this next episode. Will they succeed? I don't think so. I think their world will have already fallen apart so much that, although they will turn the machine off, their world will continue breaking. So, at the end of The Last Sam Weiss, Peter will theorize that if he gets into the machine, he can *create* an alternate reality for everyone on Earth to go live in. With Olivia touching the machine to channel the current (and create a universe) Peter will get in, thus facing his destiny. Our universe will be destroyed, and everyone will go to the new universe. The Redverse's problems will *not* heal though, because there is now an even larger inbalance, this new Yellowverse that was created. Then, in "The Day We Died", Walternate will attempt to turn the device back on (it turned off, lets say) and it won't do anything. So, Walternate will realize he really and truley needs Peter himself, full chromsomes, to make it work perfect, and will go to what he thinks is the blueverse (really the yellowverse) with agents to steal Peter and go back. His plan will be to force his son into the machine. Walternate will come upon Olivia and her FBI team and shoot them all, grab Peter, and go back to the redverse. The season will end with Peter getting into the redverse device (his true macine) with no Olivia-Current, and the last scene will be Peter's eyes glowing light and him facing his ultimate destiny. That's quite interesting, but Jeff Pinkner was very clear a third Verse will not be introduced this season. What if...Blueverse is shifted 95 years forward or back, like in the book "Winter's Tale" young Olivia was reading in "Subject 13"? Our machine was already activated by Peter in the episode Reciprocity. Walternate activated his machine with only half of the necessary DNA, which in turn connected to our already humming machine. When Peter touched it, it was connected to both worlds and running. But it is not working properly because of only half of the right DNA. Which is why when Sam did his calculations, he got zero, both worlds are going to be destroyed. Only the machine on our side was ever supposed to work. Which is why the observers told Walter never to let Peter go back, as well as Sam saying this too. The machine on our side needs to be reset. So it can work properly, whatever that means! I don't think the machine was ever suppose to be for Peter. I think the picture of Peter along with Olivia (which can also be Alt-Olivia) so possibly meaning them combining therefore their son. I know they took out AltOlivia's DNA but maybe thats the key. If they had taken out Peter's DNA it would be their world destroyed. If there is anther photo of Olivia connected to Peters picture there should be a drawing above it saying what Olivia is suppose to do. They need to turn it off together. Maybe the two of them entering the machine on both worlds at the same time to save both worlds. LouWho421, Okay, so explain why in Over there Part 2, that when Peter put his hand over the parts, it stuck to his hand, if its not for Peter then why waste Olivia's time risking her life to come over to the AU to save him if the machine wasn't for him? Why would peter be bleeding from his nose? So come on, give Peter A LITTLE CREDIT here. I hope your theory is wrong since Peter's storyline with the machine would have a complete waste. I'd just like to say, that the first part of my comment earlier was COMPLETELY RIGHT ! OMG! You have GOT to be kidding me!! Now we don't remember Peter? Does JJ know how to hang us out to dry for a summer or what????? I think the writers have left us a clue about what universe we were watching. Why was Broyles right eye blue? They may not have added a third universe maybe they added a third and forth - or to really test if we are paying attention, alternate time lines. I love the series, the episodes are so so crazy, the theories and stuff, great show, much better than the X files.